Level Priority: At lvl 1 take Swager, after that continue with Unstoppable as a priority. Play: Go with marksman and before reaching the lane help him take down jungle monster or river crab (while doing so stack up Swager until it goes red and save that for next engage with an enemy). Go to the lane and once lvl 2 look for an opportunity to engage and bully the opponents. Once you create enough free space for your team-mate, start roaming and gank other lanes, or assist your jungler. In team fights your job is to select a target that is in reach of your team and try controlling it, which means use Unstoppable following up with series of Swager and normal attack hits. Each time Ormarr deals damage, he has a chance to stun the target for 0.75 sec and deal magic damage equal to 3-7%(scales with hero max HP) of the target’s current HP. (6-second internal cooldown). This places more importance on auto attacking as Ormarr. Take into account the damage percentage is from current, not max health. Ormarr dashes forward and enhances his next normal attack to deal 150/200/250/300/350/400 (+115% of AD) physical damage and knock the target into the air. -Mobility range of this skill is 500 and it passes through walls. -Prioritize using this for controlling instead of gap closing. -Coordination with teammates is important for followup. Initiating skirmishes with this skill is what makes Ormarr so strong. Ormarr bashes the ground with his hammer, dealing 215/260/305/350/395 (+105% of AD) physical damage to enemies within range and reducing their movement speed by 50% for 1 second. Each cast that hits 1 or more champions grants Ormarr a stack of Fighting Spirit. After reaching 3 stacks, the next cast will trigger Gut Punch. -Before you start the gank, save Swagger at its red stage (3 stacks) for full-proof stun. -During team fights, aoe (area of effect) damage and slow on short cooldowns have a huge impact if you survive long enough. Ormarr swings his hammer in a circle (he is able to move while doing this), each hit dealing 100/120/140 (+50% of AD) physical damage to enemies nearby. His health is also restored by 2% of his max HP for each enemy hero hit (up to 6% at any given time). This ability cannot be interrupted, but can be affected by movement debuffs. He can also use Unstoppable while spinning. 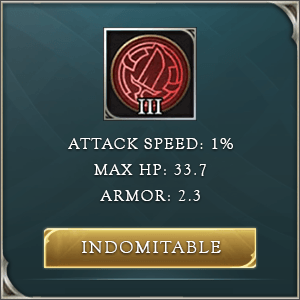 -This ability can trigger Ormarr's passive, Gut Punch. -You can move and use Unstoppable while channeling this ability. -Ganks are simple and effective. Ormarr's mobility, very good control and decent damage are a good fit for almost every combo. -Thrives in team fights with at least 3 clumped up the opponent. Both Ultimate and fully stacked Swagger relish on the opportunity to hit multiple targets. -Good team fighter. Ormarr's task in team fights is to choose, control and deal damage to the target for execution and his toolkit is perfect to do just that. -Falling behind early means his effectiveness in team fights will be very limited. -Not enough defensive tools. Considering Ormarr has to dive in and use his offensive toolkit, his item build needs to cover the weakness in the defense department so he cannot afford to enhance his strong side. -Difficult to land Swagger against careful range opponent without the use of Unstoppable. 30-second cooldown: Deals 800 true damage to nearby minions and monster and stuns them for 1 second. AoV Ormarr Leveling skills: Prioritize Unstoppable as it reduces cooldowns for the skills you use for engage, cc, damage and disengages. The only exception is level 1 where you take Swagger first. Laning as Ormarr: Early on Ormarr is all about breakpoints and timing fights around them. While waiting for the first breakpoint, level 2, build up Swagger stacks to the red phase. Once you reach 2nd level engage the enemy with Unstoppable, Normal attack, then Swagger for stun and again Normal attack. After this, you should fall back and again start building Swagger stacks up. This is the time to plan ahead, look for the lane you are going to gank and take the defensive item for that lane. Even tier 1 armor/magic resistance is important for Ormarr, sticking power depends on the ability to tank enemy harassment as much as possible. From this point onward Ormarr's role is to roam, gank and assist all lanes. If playing jungle, the difference is you build Leviathan first and pay special attention to the amount of Mana you have and visit Sage Golem accordingly as you spend a lot on a jungle clear. Start jungle from Might Golem, go for ganks in mid lane or at least harass and move on to take Sage Golem. From this point onward visit lanes as often as possible, abuse how good Ormarr is in skirmishes/ganks. Team fights as AoV Ormarr: In team fights, Ormarr's role is to enable lockdown on the primary target and take the pressure off from ally main damage dealers. You do that not by starting fights but by following up on your main tank initiation, pick a target in the range of your team carries and make sure to stick to it by first knocking it up with Unstoppable then following up with Swagger and while those are on cooldown use Walking Tall. Do not underestimate and/or ignore the power of your normal attacks, those can proc Gut Punch and its damage and control strength can make a difference in executing the enemy. Maybe not so much for damage, but when you provide 1 second of free damage on a target for your marksman or mage... games have been won/lost on less than that. Also, pay attention to the current state of your health compared to enemies. If lower than 50-60% have Unstoppable ready to disengage. It is better if you can escape, at the same time knock up the enemy and wait for its cooldown so you can re-engage. This is the second part of team fights for Ormarr... constant engaging, stun/slow, disengage and re-engage. You need to make those moments count, so do not engage if it won't buy time for your team to do their job.